Mayor Teresa Jacobs’ fifth-annual Holiday Heroes Toy Drive featured a special one-day collection event at the World’s Finest McDonald’s on Sand Lake Road on Dec. 4. 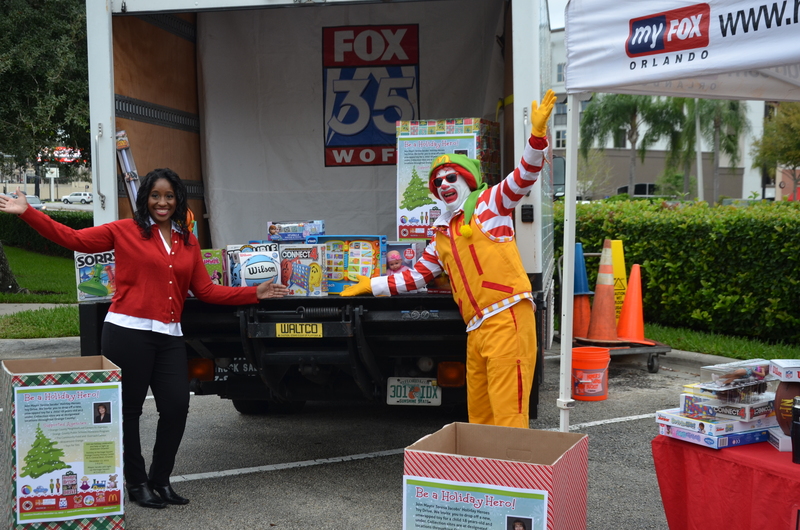 Toy Drive partner WOFL Fox 35 Orlando broadcast the event live on its daily morning show Good Day Orlando and encouraged citizens to stop by and drop off a new, unwrapped toy between 7 a.m. and 7 p.m. Although Orange County citizens responded generously, toy donations are still being sought to help children in Orange County during this season of giving. Orange County employees who serve as Toy Drive Ambassadors spoke with Good Day Orlando’s reporter David Martin throughout the morning about the importance of Mayor Jacobs’ Toy Drive and how the initiative has brightened the holiday for local families and children in need during the last four years. The Neighborhood Center for Families (NCF) is a community-based collaborative of area public schools, government agencies, churches, grassroots organizations, and nonprofit service providers. These agencies operate under the NCF to provide assistance to the children and families of Orange County of greatest need. Ronald McDonald also joined the cause and encouraged citizens to donate to the Holiday Heroes Toy Drive, which Mayor Jacobs launched on Nov. 17 at Orange County’s Board of County Commissioners meeting. Since 2011, the Toy Drive has collectively provided 12,155 toys to help bring a smile to children in Orange County who may not have a single present to open this holiday season. Another opportunity to donate toys and enjoy great family fun is Orange County’s signature Holiday at Heritage Square event, which features musical performances, a visit with Santa Claus, games and holiday crafts, special holiday prizes, pet adoptions by Orange County Animal Services, and much more. The event will be held Dec. 12 from 2 to 6 p.m. at the Orange County Regional History Center. There are also numerous donation locations across Orange County that are still receiving donations through Dec. 14. Drop off locations include the Dr. Phillips Center for the Performing Arts’ Box Office, co-working facility Canvs, Orange County Fire Stations and Orange County Parks and Recreation Centers. Toys will be delivered to children in need through the Orange County Neighborhood Centers for Families, the Community Food and Outreach Center, Orange County Public Schools’ Homeless Program, Wraparound Orange and Toys for Tots. To learn more about the Holiday Heroes Toy Drive and to find a donation location near you, visit www.ocfl.net/holidayheroes.